RK Tek has developed an outstanding option for your Lay-down 700 engine. Rather than spend your hard earned $$ on the new 800 or 1000cc sled, you can upgrade your 700cc engine to a very powerful 800cc form and rival the 1000cc sleds. 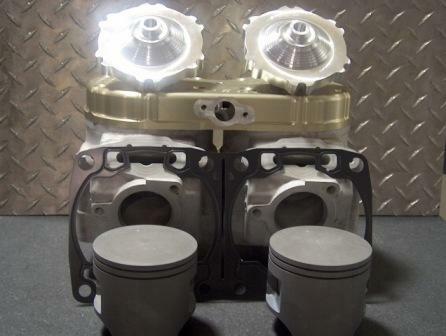 Our M7 Torqueline Billet 7075 Head is nothing short of AMAZING! This head will completely change the way your engine performs! There is NO other "bolt on" item you can add that will provide the gains this head will!! The ENTIRE power-band is widened and the throttle response is increased drastically! Top end speed is increased by 7-10 MPH! This head will be featured on Chris Burandt's and Chris Brown's "TRICK" sleds. This head is a "MUST" for any person wanting to get the most from their CAT TWIN! Our Billet Head will add the NEEDED cooling and increase the power, as well.... The power will come on sooner and allow for more over-rev. This will come in real handy when adding pipes!!! I know this will sound like a "LINE" but our head coupled with a timing change (via offset key-way 05 model only) and a single pipe will pull 10 lengths on a stock M7. Sound hard to believe?? Most will agree.. but vigorous testing on the M7 by RK Tek has allowed for this kind of a power gain!! We have discovered a special type of porting alteration that allows for a very smooth power delivery and NO sacrifice of low end power and especially no sacrifice of engine reliability. On the ALL the Lay-down Twins, we found the port arrangement lacking to say the least.